At the last OpenStack Design Summit in Austin, TX we showed you a preview of deploying your physical server and network infrastructure from the top-of-rack switch, which included OpenStack with your choice of SDN solution. This was made possible by disaggregating the network stack functionality (the “N” in Network Operating System) to run on general purpose, devices-centric, operating systems. In the world of the Open Compute Project and whitebox switches, a switch can be more than just a switch. Switches are no longer closed systems where you can only see the command line of the network operating system. 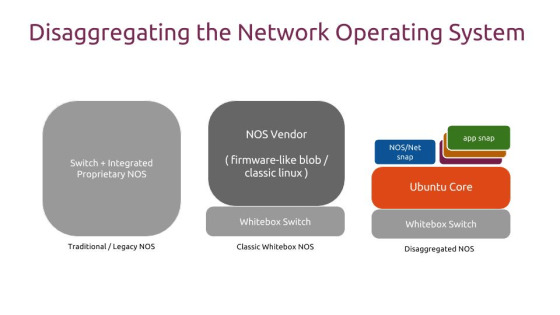 Whitebox switches are produced by marrying common server components with high powered switching ASICs, loading a Linux OS, and running a network operating system (NOS) functionality as an application. The user has the ability to not only choose hardware from multiple providers, they can chose the Linux distribution, and the NOS that best matches their environment. Commands can be issued from the Linux prompt or the NOS prompt and most importantly, other applications can be securely installed alongside the NOS. This new switch design opens up the ability to architect secure distributed data center networks with higher scale and more efficient utilization of existing resources in each rack. Since the last ODS we have witnessed a continued trend for whitebox switches to provide more server like and general purpose functionality from increases in CPU, memory, storage, internal bandwidth between the CPU and ASIC, to power-management (BMC), and secure boot options (UEFI+PXE). 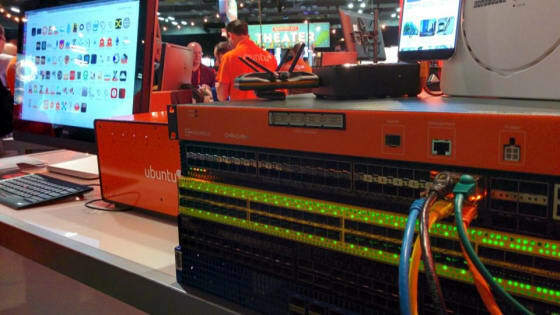 This month Mellanox announced the availability of their standard Linux kernel driver included in Ubuntu Core 16 (and classic Ubuntu) for their Open Ethernet Spectrum switch platforms. More recently Facebook announced the acceptance of the Wedge 100 into OCP that includes Facebook’s OpenBMC and their continued effort to disaggregate the stack. 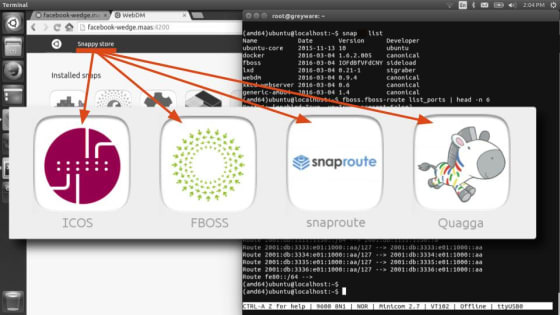 At this OpenStack Design Summit we are also going to show you the latest integration with MAAS, how you can use snaps as a universal way to install across Linux distributions (including non-Ubuntu non-Debian based distributions), and deploying WiFi-based solutions, like OpenWrt, as a snap. Please stop by our booth and let us help you plan your transition to a fully automated, secure modern datacenter.